All students wishing to join the UCMB Percussion Section must audition for a spot. 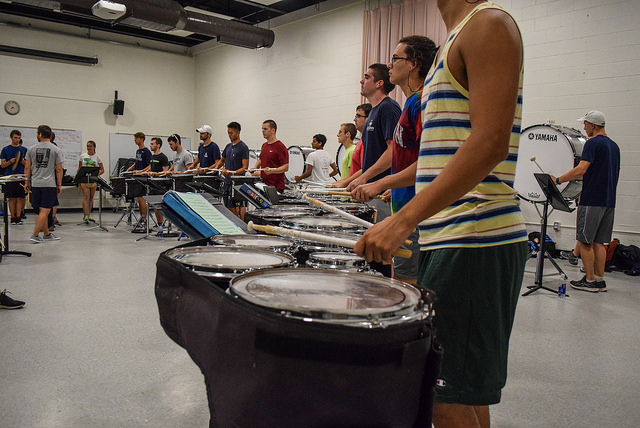 Audition and preseason camps are held throughout the summer to help prepare for the upcoming season. While these camps are not mandatory, it is strongly encouraged that you participate. Audition materials and music will be available via Google Drive to all students that complete their UCMB Membership Form. Please complete your UCMB Membership Form before attending the camps. If you cannot make any of the camps please contact us to let us know. All camps are held at the Music Building, 1295 Storrs Rd. Camp 1 Saturday June 8 9:00 a.m. – 5:00 p.m.
Camp 2 Saturday June 29 9:00 a.m. – 5:00 p.m.
Camp 3 Saturday July 13 9:00 a.m. – 5:00 p.m.
Camp 4 Saturday August 3 9:00 a.m. – 5:00 p.m.
At the first summer rehearsal you will be placed with the section you wish to audition during the morning sectional time slot. At this time playing style and technique will be addressed along with the audition material. During the afternoon sectional time individuals will audition one at a time for the percussion staff. Once everyone has auditioned placements will be announced. All placements are made in the best interest of the line. You will be placed where you will be able to successfully contribute immediately. Keep in mind that these initial placements are contingent upon continued commitment and improvement. Audition materials can be downloaded via Google Drive. Be able to play each exercise at a speed of 100 to 160 beats per minute, using a metronome to insure rhythmic accuracy. If you do not own one please purchase one or use any of the sites online that provide free metronomes. The following site offers a metronome: www.metronomeonline.com. Free metronome apps are also available for download through your phone app store. Everyone will be receiving a handbook/exercise packet at the summer sessions. The exercises in the packet are our “bread and butter” so spend most of your time on them. Apply the techniques developed through the exercises to the rest of the music included within the packet. Please have a three ring binder with clear plastic sheets to organize and protect all music. ATTITUDE IS EVERYTHING! Come to each rehearsal ready to have fun, work hard, and act as a team. Individuals do NOT form the drumline. Everyone is an essential part of the line and is expected to put in equal time and effort in order to achieve success. DON’T GIVE UP! Being a member of the drumline can be very challenging. If you are having difficulty with something, SLOW DOWN! Practice measure by measure if necessary until you can play the part. You will be surprised how fast you can learn this way. Good luck and practice hard! Only 20!